Mischioff's Tibey Collection is characterized by exclusive natural materials and longevity. The special loop & cut knotting technique makes the designer rugs easy to care and gives them an attractive charm. 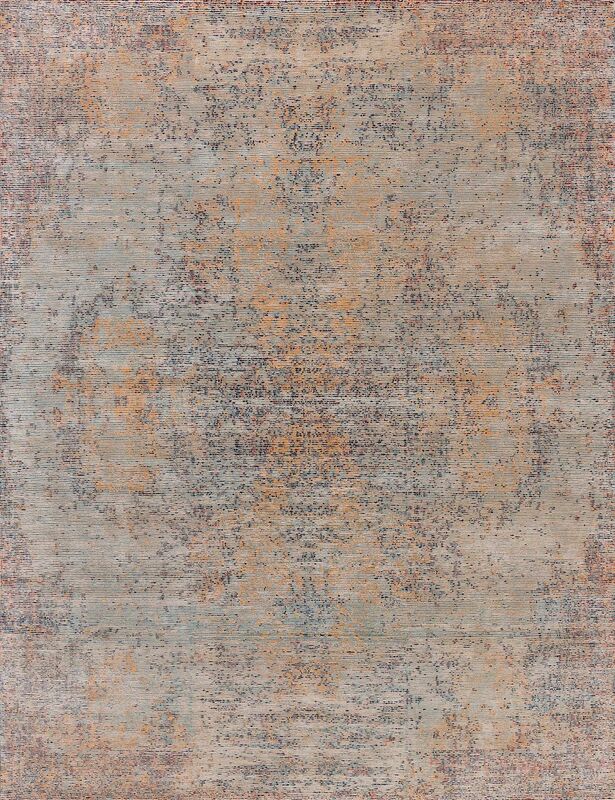 The new design TB14R has been declared as our new rug of the month. Convince yourself now of its exciting features! 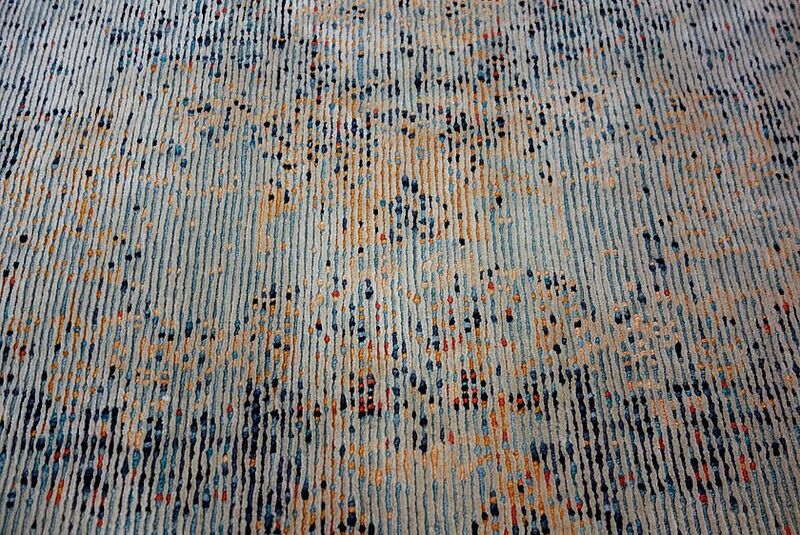 If you want to reveal the secret of this rug, you need to take more than a look at the surface structure. The R in the product designation TB14R stands for reverse and indicates the design, which is superimposed as a lower loop of a monochrome silk line. The soft pastel shades, from light blue to golden orange, combined with dark nuances, inconspicuously fade into the background while the beige silk sets the tone. The Tibey TB14R owes its unpretentious and at the same time extremely elegant look to this special structure. It seems as if an artist deliberately veiled his motif in order to arouse the curiosity of the beholder and to stage the true beauty of his painting with a mysterious veil. Like little particles, its colours dance underneath. Only those who take their time and pay close attention to the design will discover the special feature of our rug of the month: A discreet medallion that completes the decorative vintage look of the home accessories excellently. Depending on the angle of view, the visual perception changes, enriching the sight with pure variety. Since warm shades occupy the leading role in this breathtaking play of colours, the quality rug promotes an inviting overall impression. However, the Tibey Collection's loop & cut technique is not solely responsible for visual effects. The sense of touch is also pampered by the elevated silk, which provides a wonderfully soft feel. Tibey TB14R feels like a pure silk carpet, because the woolen line (loop) remains closed in the background, slightly overlain by the cut silk line (cut). The seven to nine millimeter pile height is very gentle and characterized by an aesthetic shine. In the video you will gain an impression of the unmistakable charisma. The artful design of the Tibey TB14R shows to advantage in spacious living environments. There, the textile accessory can unfold its effect as a work of art. By picking up single colours of the rug in the furniture, a harmonious furnishing concept can be achieved. Impressive accents are created, for example, with upholstered furniture or side tables in dark blue. If you prefer an bright interior, do not focus on the colours in the background, but on the beige of the silk line. Like all the company's products, Tibey TB14R is manufactured in the Mischioff manufactory in Nepal. Experienced weavers process Himalayan highland wool and silk in equal parts, using the design templates to create the highest quality carpets. The production takes place according to fair trade guidelines. Fair working conditions and wages are as much a matter of course as a familiar approach throughout the entire team. The independent Label STEP has certified our fair trade production and regularly checks the conditions. We actively pursue climate protection by using the available resources sparingly, using natural materials and cleaning every carpet in an environmentally friendly manner. Neither our skilled workers nor our products come into contact with substances of concern. Benefit from our enchanting TB14R and delight your customers with an exclusive designer carpet! The model is durable, robust, easy-care and helps private homes, hotels, offices and various other spaces to create a unique atmosphere. Choose a standard size or order a custom size! We look forward to your product inquiry. You would like to know more about TB14R? The product is presented in the current Mischioff Catalog, which you can request directly online for free. Private customers can find regional contact persons via the retailer search.